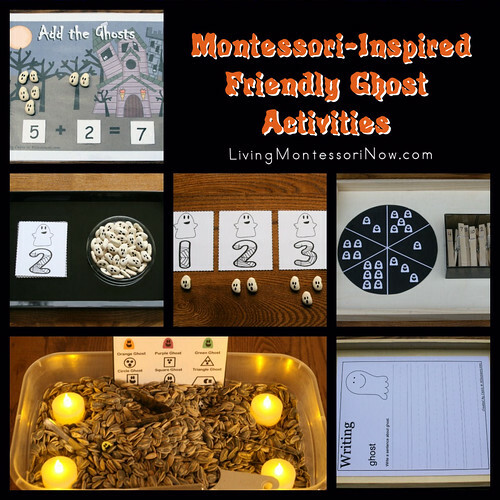 While ghosts aren’t a typical part of the Montessori curriculum, many progressive Montessorians like me enjoy using friendly ghost activities before Halloween to make the holiday less scary for preschoolers … and because they add interest and fun to learning activities in October. 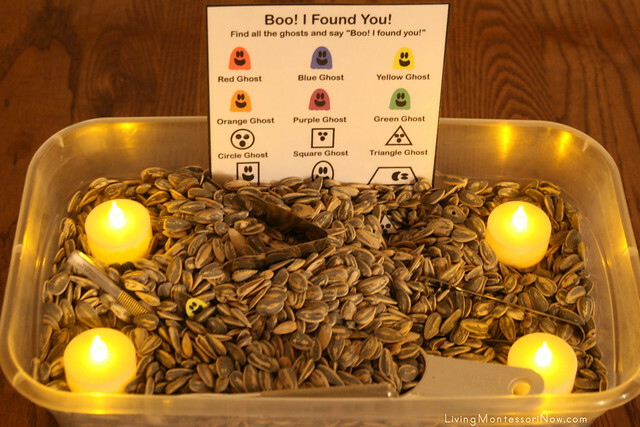 Today, I’m sharing the links to free printables I’ve used to create Montessori-inspired ghost activities for preschoolers through first graders. The printables I’m using are from Three Ghost Friends, Learning Ideas – Grades K-8, and 3 Dinosaurs. 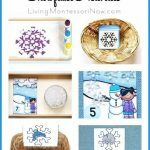 All three sites specialize in hands-on learning fun, and I’m just sharing ideas from very few of their printables. Eric at Three Ghost Friends has LOTS of fun ghost activities … and who could be frightened by these friendly ghosts?! I had fun creating a “Boo! I Found You! Homemade Look-and-Find Game.” In the original post, the printable is used to create an I-Spy bottle, which is a great idea. I decided to create a sensory tub using the printables. Montessorians use “ellipse” as the term for what most people call an “oval” and “oval” for a 2-dimensional egg shape. Eric was kind enough to add a special printable for Montessorians with an “Ellipse Ghost” instead of an “Oval Ghost.” He also created a larger version of the printables for a sensory tub. Instead of making a regular-size sensory tub, I found a shoebox-size tub at Dollar Tree to make a mini sensory tub. I used sunflower seeds so preschoolers could have a snack at the end of the activity. I included various types of tongs, a scoop, and a nutcracker (for preschoolers who couldn’t open the sunflower seeds with fingers alone). I also added 4 LED tealight candles from Dollar Tree. Turning the candles on during the activity and off when the activity is put away adds another practical life activity to the sensory tub. If you use the smallest printables, it’s quite challenging to find the color and shape ghosts. 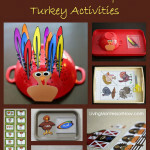 So even older preschoolers could have fun with the activity. Note: This obviously isn’t intended for toddlers. Not only are the sunflower seeds dangerous for them, but the shapes are too small as well. For toddlers, it would be better to make the I-Spy bottle with the shapes. If you’d like another activity for toddlers, check out the “Feed the Ghosts: Color Craft Stick Sort,” using 2 32-ounce containers and colored craft sticks. 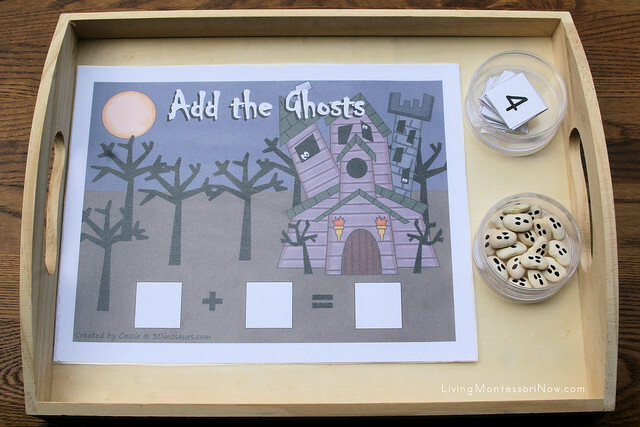 3 Ghost Friends has a “Ghost Counting Wheels” printable with counting wheels for 1-6 and 5-10. This tray was very simple to prepare. I just printed out the counting wheels, laminated them, and cut them out. If your activity will have heavy use, be sure to cut out your wheels before laminating and leave a laminate edge. I just added numbers to the clothespins (with the exact number of clothespins for the counting wheels) with a permanent marker. 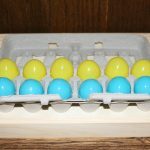 The tray is an inexpensive wooden tray from a hobby store. 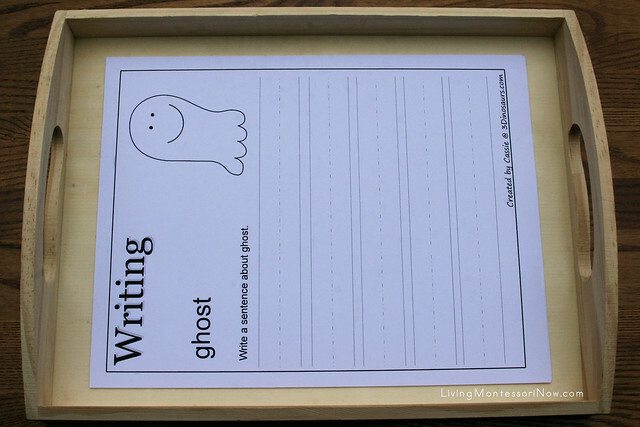 For many more hands-on activities from 3 Ghost Friends, check out the “Activity Ideas” page. Learning Ideas – Grades K-8 has “Friendly Ghost Odd and Even Sort and a Linky Party” with super-cute, friendly ghosts. The linky party even has more friendly-ghost printables. 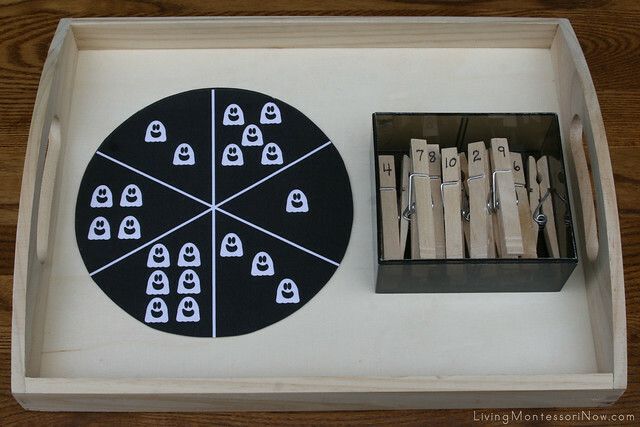 I loved these printables for creating a DIY numbers and counters activity. 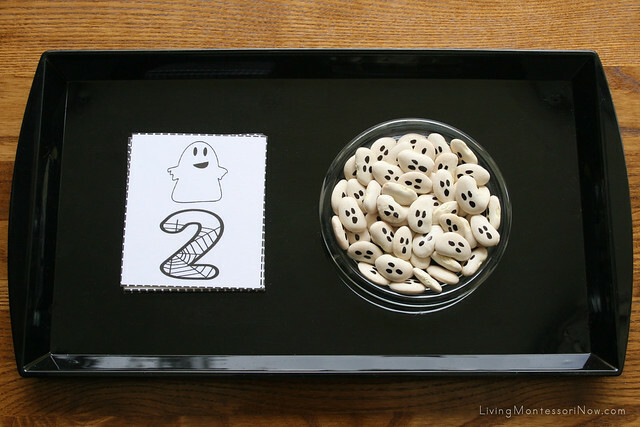 To make 55 ghost counters, I added eyes and mouths to lima beans with a permanent marker … easy peasy! The tray is a black Economy Tray from Montessori Services. When showing how to do the layout, I recommend placing the lima-bean ghosts in rows of two with a leftover ghost centered below the last row. It’s a standard Montessori layout for cards and counters and gives a visual representation of odd and even. If you have exactly 55 “ghosts” for the numerals 1-10, that will serve as a control of error. 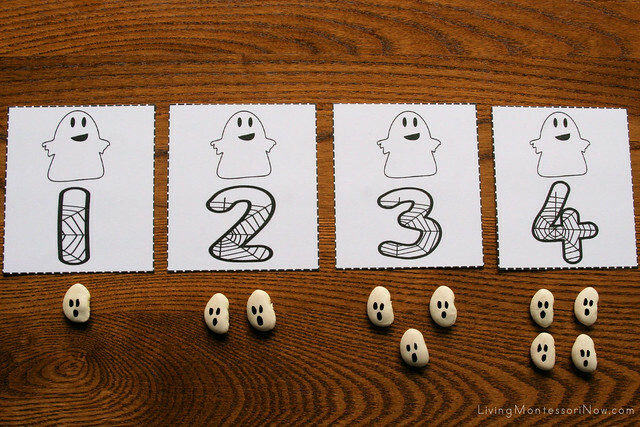 You could even add more numerals (the printable has 1-99) and the cute “odd” and “even” ghosts if you’d like to add an odd-and-even activity as an extension for children who can easily count and identify 1-10. The Halloween Pack from 3 Dinosaurs is HUGE! 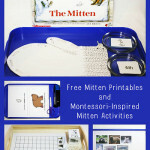 The pack is designed for ages 2-7 and includes literature-based activities. This pack has all sorts of very-cute Halloween images, including very-cute and friendly ghosts. 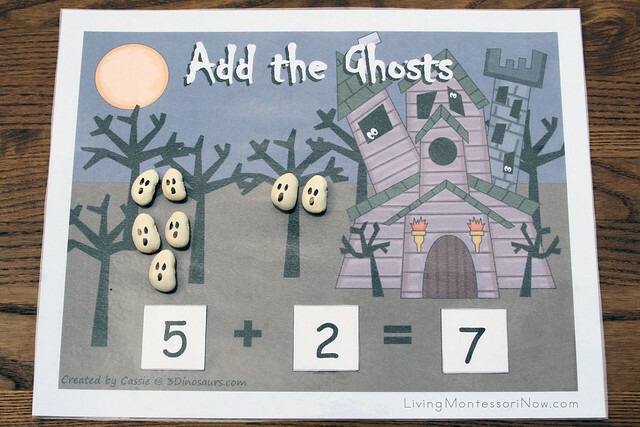 Some of my favorite printables are the ghost addition, subtraction, and counting pages. These are amazingly simple to prepare. Many of the 3 Dinosaurs printable packs have counting, addition, subtraction, greater than/less than, and/or word problem printables with numbers that are interchangeable. 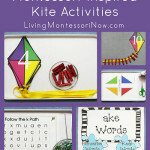 I just used the numbers from the “Montessori-Inspired Ocean Math Activities” I prepared in June. I would probably put both the addition and subtraction pages on a tray for children who are ready for them. 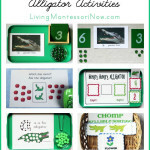 For presentation ideas, check out the Montessori-Inspired One Fish, Two Fish Addition Tray in my February post. You should be able to easily adapt the presentation for this activity. For younger children, I would make a separate “Count the Ghosts” tray. For each tray, be sure to have the exact number of ghosts needed for the highest sum or difference or to go to the highest counted number you’re using in the activity. I like to use 3-dimensional objects whenever possible, so I used the lima-bean ghosts for the activity. 3 Dinosaurs has very cute ghosts that can be printed out and used if you prefer. In the Halloween Pack, Cassie from 3 Dinosaurs also has a fun creative-writing activity for children who are starting to write stories. 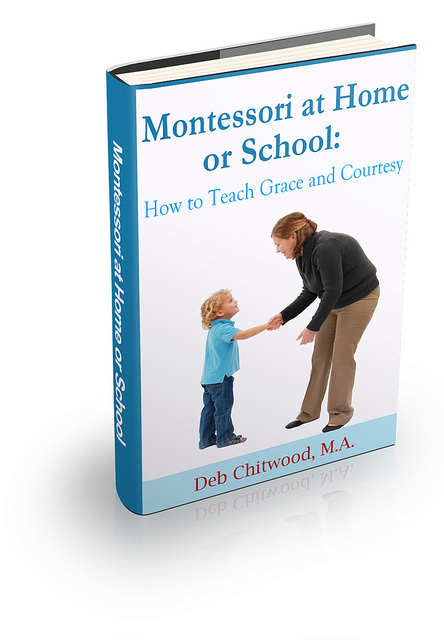 I would just print out as many pages as you need for your homeschool or classroom and store them on a tray. If you don’t have a separate place for pencils, you could add a Halloween pencil for extra interest. Younger children could always dictate a sentence or story to you if they’d like to create their own ghost story. I love your link -up! I get many great ideas from here every week! Have a nice week! 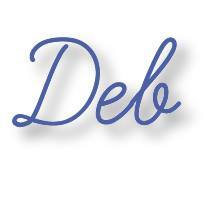 Thanks for hosting- I always love stopping by to link up!